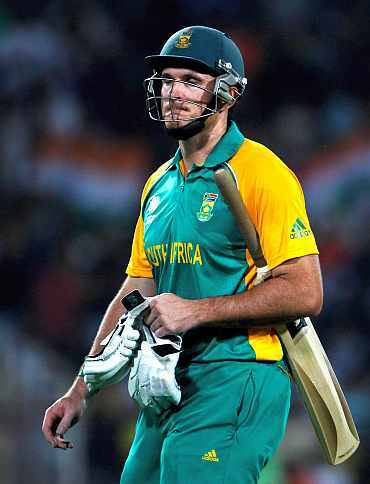 Outgoing South African captain Graeme Smith feels the immediate future of the team is bleak in the wake of its shock World Cup ouster and a lot of work lay ahead for the new skipper and coach. New Zealand beat the South Africans by 49 runs in the World Cup quarterfinals, a match in which the last eight Proteas wickets fell for just 64. It was a rude shock for Smith's men, who won five of their games leading up to the quarter-finals, including a nail-biting encounter against India in Nagpur. "We played a few outstanding games and there were various highlights which we can look back on, but for now it is going to be difficult to for the team and the immediate future looks bleak," Smith told the Afrikaans weekly Rapport after the squad returned home late last night. "I know that the team will emerge stronger from this setback, but none of us can shy away from the reality. We had an exceptional chance of winning the World Cup and we can only blame ourselves for the defeat," he said. But Smith also held out some hope for the future. "All is definitely not lost and the country's cricket is now entering a very exciting era," Smith said after what was his last game at the helm. Smith had earlier announced that he would retire from the One-day captaincy after the World Cup. He was full of praise for the spinners in the team. "The way Imran (Tahir), Robbie (Peterson) and Botes (Johan Botha) bowled forebodes lots of good things for the side. We now have three spin bowlers who can take wickets and on top of that there are a few young players who must now be developed," he said. Smith singled out Faf du Plessis for his valiant effort in trying to rescue the Proteas on Friday a 38-run knock. "It was very encouraging to see how (Du Plessis) batted under tremendous pressure, and Dale (Steyn) and Morne (Morkel) also showed that that they are going from strength to strength as fast bowlers. 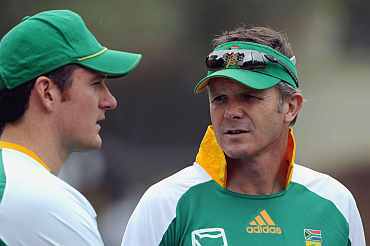 Smith had some advice regarding the "big decisions" that now had to be taken such as who would take over from him as captain and the replacement for coach Corrie van Zyl. Like Smith, Van Zyl has stepped down after the World Cup. "It's important that the new coach be appointed as quickly as possible, because there is a lot of work to be done," said Smith.